New Jersey's Democrat-led Assembly on Monday passed a half-dozen bills aimed at strengthening the state's already-strict gun laws, including a measure to permit the seizure of weapons upon a court order. The legislation comes just days after tens of thousands of students marched across the country to call for tightening gun laws and the same day as Second Amendment advocates in Trenton rallied against the legislation. The bill's sponsors cast the measures as part of an effort to keep New Jersey's firearms laws among the most stringent in the country. The legislation was introduced before the fatal Florida high school shooting in February that left 17 people dead, but began to move forward after that tragedy. "New Jersey's gun safety laws are among the strongest in the nation and we must keep them that way," Assembly Majority Leader Louis Greenwald said. The legislation also drew an estimated 2,000 people who opposed the bills to the War Memorial in Trenton, according to a state police estimate. Many wore National Rifle Association hats and carried signs that read" NRA Stand and Fight." "We have to fight for our rights, plain and simple," said Rocky McGuigan, 54, of Mount Laurel, New Jersey, who attended the event with his dog, KC. "Our forefathers did. We have to still do it today unfortunately." Not all the legislation divided lawmakers along partisan lines. One bill to ban armor-piercing bullets, which are already prohibited, passed with zero no votes and Democratic and Republican support after the sponsor explained the state attorney general was seeking the measure to better line up with federal standards. But the other measures drew opposition from Republicans. Second Amendment advocates raised concerns about a measure that would allow guns to be seized upon a court order after a health professional reports someone poses a serious threat to themselves or others. Republican Assemblyman Michael Patrick Carroll called the measure "punitive" in nature. Another measure bars people who pose a "significant danger" from possessing or purchasing firearms under a new class of protective order. 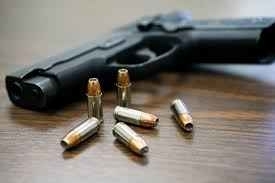 Another bill lowered the limit for magazine rounds from 15 to 10, with an exception for a popular .22-caliber firearm. Other legislation required background checks for private gun sales. A sixth bill would require residents to show a "justifiable need" to get a carry permit. The bills now go to the Democrat-led Senate, where President Steve Sweeney says the Senate will be passing the bills as well. Democratic Gov. Phil Murphy said he supports the bills. "The people of New Jersey have demanded we act, and we must," he said.